Each year I plan at least one solo hunt. This year was an 8 day back-country hunt. I have hunted back-country solo for 5-7 days on numerous occasions but 8 was going to set a record. Over the course of the 8 days I covered 80+ miles of country and 60,000+ ft. of elevation gain/loss. The elk seemed to be dead center in the middle of the hardest to get to places. This made the physical aspect of the hunt hard but it made for great low pressure hunting situations. In 8 days I only ran into two humans at 9:30 at night hiking in the dark back to camp. They were scouting for the rifle hunt. I did glass up one tent so I know someone was there but I never ran into another hunter. Truly a dream come true! Coming down to my last day I had been into bugling bulls 5 of the 7 days. I was tired and frustrated and now was limited on where I could kill an elk as my pack out time was limited. So for my last day I decided to hunt a spot I had heard a bull in earlier but that was close enough to a trail head that I could still pack out the animal if I got lucky. My final morning of the hunt using a location bugle I located a bull down a small draw from where I was. This bull was not aggressive. As I tried to close the distance and pin point his location, he shut up and I was stuck knowing the general area he was in but not exactly where he was. Based on some tracks I had seen that morning I felt like I knew the direction he had come from so I backed out and planned to set up later that night on where I thought he might head based on the tracks. I was in position early just in case he was up and at em. I didn�t want to overcall so my plan was to wait for him to make the first noise and then I would decide if my ambush was going to work or if I needed to get more aggressive. From 5-7 I was pretty at ease but as dark crept closer a rain storm started and my anxiety increased. Finally with 30 minutes of light left I let out a few soft cow calls. Within seconds the bull bugled below me probably 250 yards. I tried to see if he wanted to play but quickly came to the conclusion he was happy where he was and was not going to come to me. The wind was howling and the rain was starting to get heavy. I knew it was now or never. I snuck down to a little clearing I thought he was in and as I poked my head out to see, there he was broad side. I ranged him at 95 and knew I needed to close the distance. I snuck around the bush I was behind and to the last one I could use as concealment. I poked my head out and ranged him at 49. Inside 50 is my sweet spot so I dialed in my pin stepped out from the bush and released what felt like a great arrow. Upon impact he whipped around and ran down the hill stopping at 72 yards. He looked hurt but in the conditions I couldn�t see good enough know how hurt. So I ranged him again set my pin to 72 yards and put one more arrow in him. To make an already long story less long he went down less than 130 yards away from where he was standing for my last shot. Unfortunately all my electronic devices were dead by this point in the hunt so there are no field photos. But below is my first ever six point bull with my bow. I still can�t believe it all came together. I feel so blessed for the opportunities and health I have to hunt the way I like in the back-country. 1. "RE: 2018 Solo Hunt"
Heck of a story congratulations. 2. "RE: 2018 Solo Hunt"
Congrats great story and bull. 3. "RE: 2018 Solo Hunt"
Well played, great story. You deserved that bull, congrats! 4. "RE: 2018 Solo Hunt"
Nice work, well earned. Great mass and nice back forks too! 5. "RE: 2018 Solo Hunt"
Awesome bull and great story. Congrats ! 6. "RE: 2018 Solo Hunt"
7. "RE: 2018 Solo Hunt"
8. "RE: 2018 Solo Hunt"
Good job! Much respect for your accomplishment. 9. "RE: 2018 Solo Hunt"
10. "RE: 2018 Solo Hunt"
That's awesome! Congratulations! Great looking bull. 11. "RE: 2018 Solo Hunt"
12. "RE: 2018 Solo Hunt"
13. "RE: 2018 Solo Hunt"
14. "RE: 2018 Solo Hunt"
Way to go-an impressive story and nice Bull. You had a great hunt you will never forget. 15. "RE: 2018 Solo Hunt"
enjoyed the story, nice bull. 16. "RE: 2018 Solo Hunt"
17. "RE: 2018 Solo Hunt"
18. "RE: 2018 Solo Hunt"
Good job! Congrats on a great bull! Much respect for your accomplishment. 19. "RE: 2018 Solo Hunt"
Are you going back in the same area this year? 20. "RE: 2018 Solo Hunt"
21. "RE: 2018 Solo Hunt"
Yep. I was drawn for mule deer last year, putting in for elk again this year, have to wait a year for deer. Whitetail is OTC. Did see a couple WT bucks last year. 22. "RE: 2018 Solo Hunt"
23. "RE: 2018 Solo Hunt"
Yes they have cut them back. It may not be a bad thing to increase the quality of animals in there. I hope they cut the cow tags as well and cap the WT would be nice. The amount of hunters and traffic on the central part of the unit is unreal. All road hunters of course, it's like rush hour. I backpacked into the southern part the last of October first of November. I know where I would apply for mountain goat! Seen some dandy's everyday! Got into deer and elk. My elk tag was for the south side of the creek, deer to the north. Didn't see shooters, a couple came close, wish I spent more time earlier in that portion of the unit. 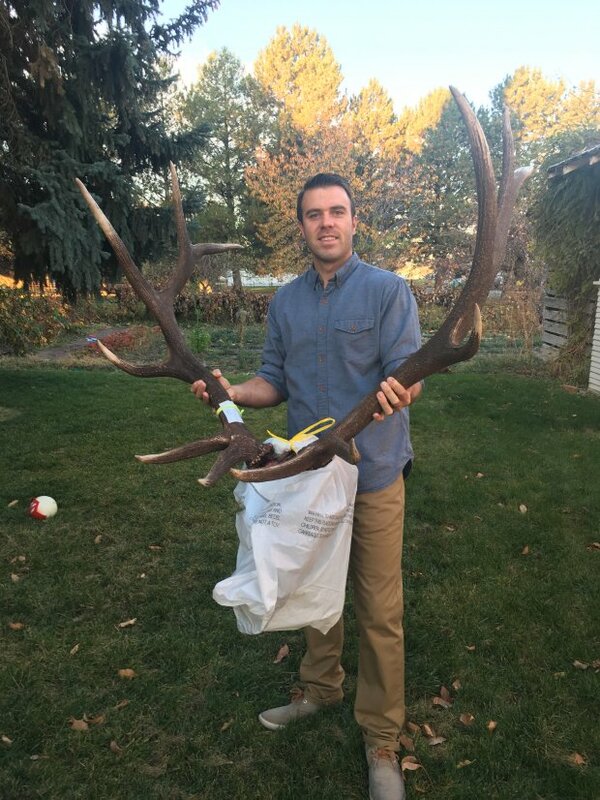 Excited to apply this year, was unsuccessful for Wyo elk draw, but should get my deer, and I drew for Arizona bull elk late rifle. Time to hit the trails heavy and get ready! 24. "RE: 2018 Solo Hunt"
What are you guys talking about? Unit? State? Species?